Sports and politics are, indeed, as antithetical as Los Angeles and Buffalo (with sports, if anything, representing the Eastern city in the analogy). In politics, opinion and popularity are paramount; in sports, they count for very little. That’s the reason why college football fans hate the BCS system as a vehicle in determining the national champion. On its own terms, the system is rational, but it makes opinion paramount and cuts the small and mid-size guy out of the process. That’s way too much like politics and way too little like sports. Because sports and politics are so different, I try to compartmentalize the two. For example, I don’t root against teams because they come from Blue states. Even my preferences for national teams in soccer are driven more by considerations of sport than by politics. I’ll never be a fan of the German national team, but I reserve my true antipathy for other national teams that, in my view, play the game objectionably. None of this means that politics don’t, or shouldn’t enter, into a sports fan’s preferences for individual athletes. For example, conservatives tend to get excited about Tim Tebow and Jeremy Lin (I don’t, but I like both of them). This is natural enough. Both appear to be rooted, humble, and religious. Many conservatives were fans of Muhammad Ali. This, I found odd. Ali was unpatriotic, ungracious, and a braggart (and don’t tell me that “it’s not bragging if you can do it” — if you can do it, it’s bragging; if you can’t, it’s lying). Ali came close to delivering a knock-out blow to sportsmanship. It turns out that conservative sports fans tend to like athletes who are extremely humble and athletes who are extremely brash. Maybe we’re extremists after all. 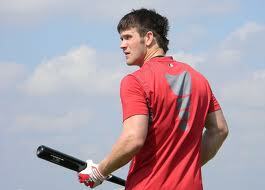 This brings us to Bryce Harper. As he was rising rapidly through the minors, Harper developed a reputation (apparently well-earned) for extreme brashness. I was prepared to dislike him for that reason. The star rookie for the Washington Nationals has woken up Major League Baseball, and watching it unfold has reminded me of nothing so much as the collapse of the old political paradigms and the inevitable and upcoming rebirth of conservatism in November. Judge has been criticized for the column, but it’s worth reading. As long as we remember that the rebirth of conservatism in November isn’t “inevitable” (a brash word) and that sports isn’t politics.